I picked these up at a local Blythe meet up when a friend was destashing shoes and they just called to me. They’re a nice camel colour (or beige, or tan, if you’d rather make them sound less sophisticated…), with a mold stitch and lace-up design. There’s even line details for where the heel meets the sole, along with a partial slit up the back of the boots to allow for ease of putting them on and taking them off. I really wish I could tell you where to buy these, because I wish I could get them in more colours. Alas, there are no markings on these boots, so my dreams of owning these in dark brown, black, and perhaps even a cream are gone. 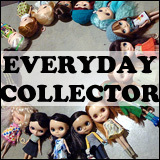 Tiny Shoe Love is a feature on BlytheLife.com to showcase and share doll shoes that grace Michelle’s picky dolls’ feet. 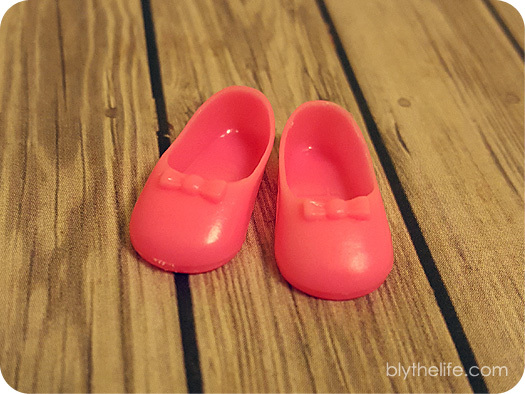 We love tiny shoes in this house, and we hope you do too! 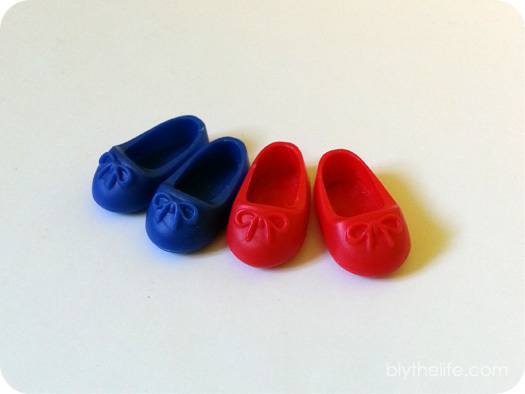 These are a pair of the tiniest shoes that I own, the tiniest of the tiny because they are sized for Petites! If you’ve never seen a Petite before, their feet are super small – just 10mm in length and 4mm in width, talk about small! 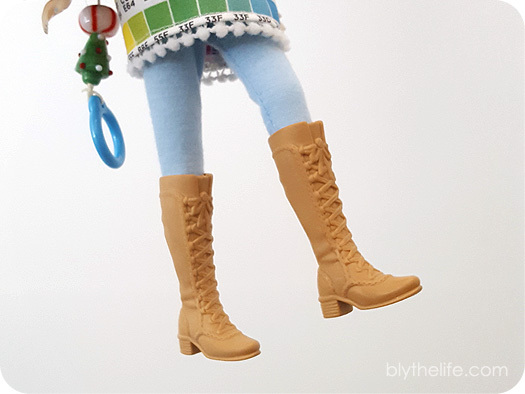 I have zero clue which doll these shoes were originally released with (potentially with an LPS?) as I received Lark fully customized and dressed. Lark is an I.G. 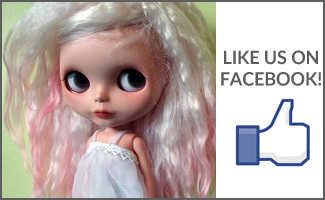 Sirenita custom Petite that my sister won at BlytheCon Vancouver 2015 (and later gave to me). 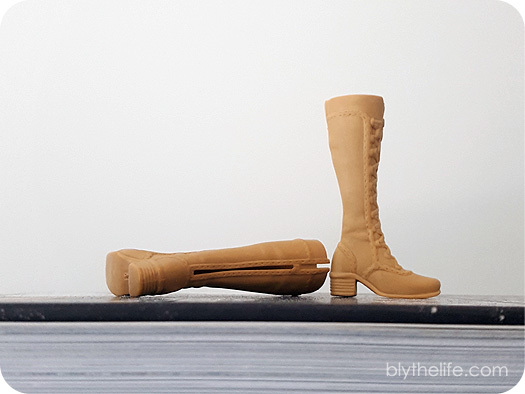 I included a pair of Neo-sized purple boots for size comparison between the sizes – it’s crazy! 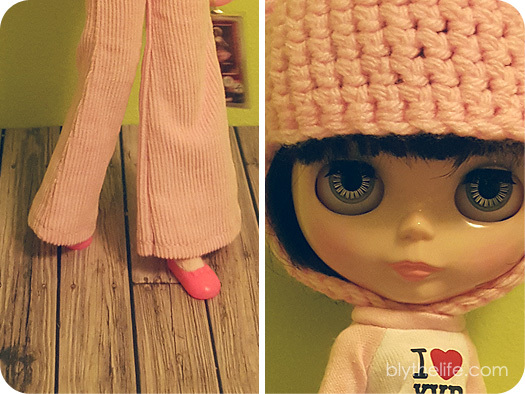 What is a doll to do when nothing seems to go with her outfit? Pick the shoes that go with pretty much anything. 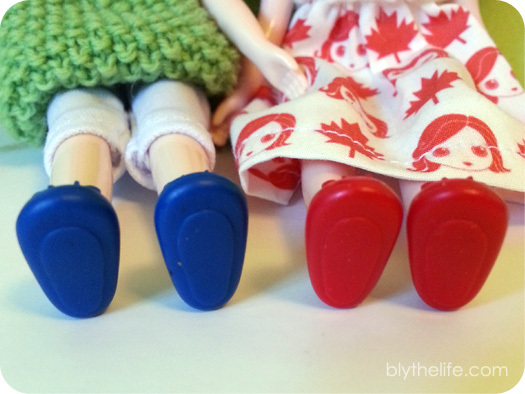 I have always loved little Mary Janes on my dolls’ feet, and when you have a doll that insists on wearing pink everything you learn to keep a pair or two of pink shoes on hand at all times. I really love these ones, I actually have no clue what doll they belong to because it came in a bag of doll accessories from a local thrift store. But let’s ignore the fact that I can’t tell you where to get your own pair and let’s just focus on how cute these shoes are! The bow detail is my favourite part, right along with the colour. Eden’s wearing: helmet/chelleshocks (me! 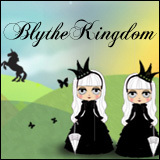 ), shirt/Luxie Lou, pants/Blythe Couture, tights/unknown, shoes/unknown. Boots. 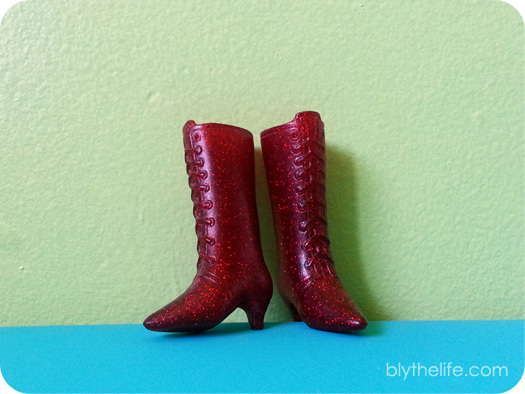 Beautiful sparkly red glitter boots. Oh yes! I recently got these from Reallusion Photography, who was destashing these boots at a local Blythe meet. Score! 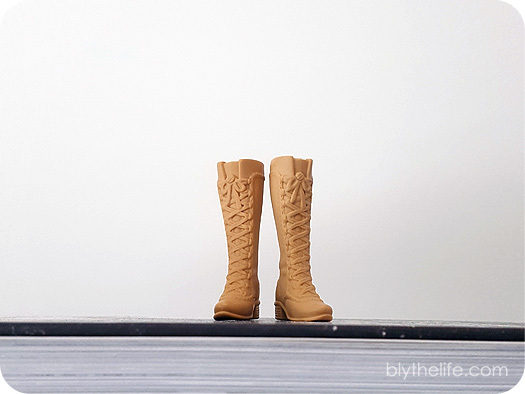 These boots are by Jemgirl Creations – I have other shoes from Jemgirl as well. They are made out of poured resin, and are delightfully glittery, very evenly mixed. Very sparkly, and it’s eye catching. I love them! These are quite possibly the most glittery, sparkly doll shoes that I own! There’s also some amazing detail that Jemgirl was able to get from the original boots, the lace detail is subtle with the busy glitter design, but it’s a fun detail to have in a quality pair of boots. 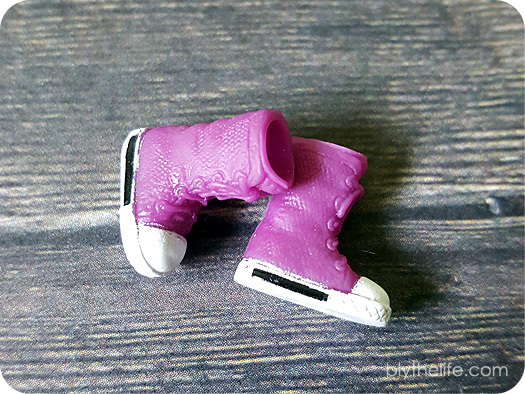 This time on Tiny Shoe Love, I wanted to show case some shoes that aren’t quite big enough for the feet of Neo or Kenner Blythe. I do have two Middies in my home that love shoes too (much to my wallet’s disapproval). 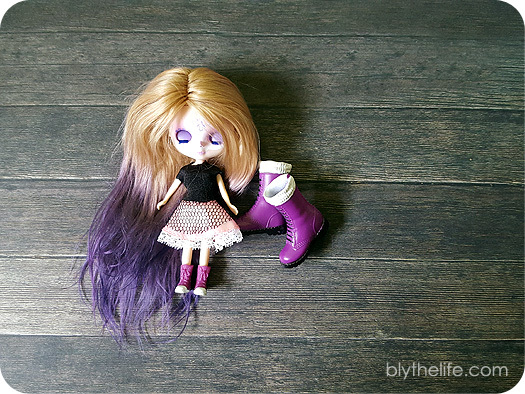 When I got my first Middie, I was suddenly face with the fact that I had this doll that came with a pair of boots that fit better on Neos than her own feet – what was I going to do? She can’t go without shoes forever… or could she? Luckily, eBay came to my rescue in the form of Kelly shoes lots! I read online that Kelly shoes can usually fit Middies well enough so I gave it a go. Thankfully, the shoes worked out okay! I got a few more pairs of Kelly shoes recently from a friend as a gift, so there’s even more Middie-sized shoes to go around! 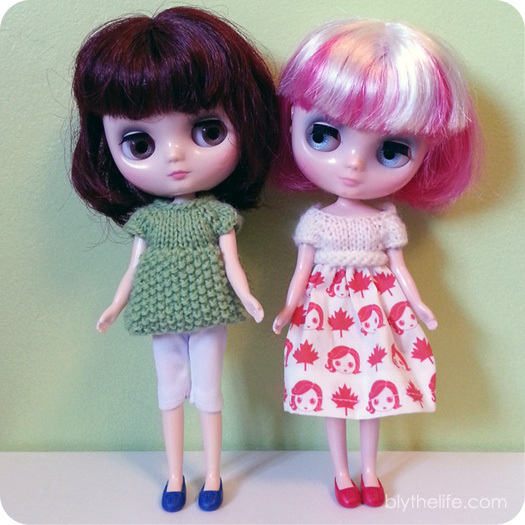 I always feel lucky to have made such wonderful friends in the doll community! My favourites right now are these super cute flats that have a bow detail on them. I think they’re great! I have them in blue and red only for now. I really like them though because they’re simple enough that they don’t distract from the outfits, but they also have a cute detail that I really like. I own flats for my own feet with bows, so I may be a little biased! At this time I only have a tiny amount of shoes just for the Middie girls, just six pairs for two sets feet! Hopefully that changes in the future – I’d love to get them shoes in white, black, and brown (my usual go-to shoe colours for their bigger counterparts). Lydia Melbourne’s wearing: dress/chelleshocks, shoes/Kelly. Kitty Brighton’s wearing: top/chelleshocks, capris/unknown, shoes/Kelly.